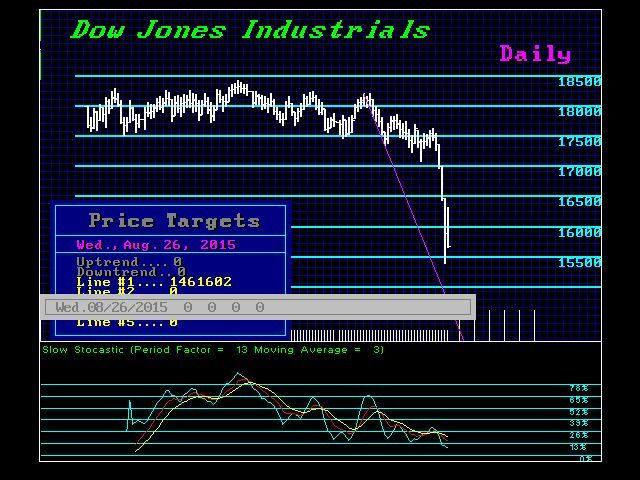 The closing of the Dow at 15666.44 was below support at 15824.73. Additional support lies at 15176.26 and a closing beneath that level will warn of a break down to the 14334 area. We do have four Monthly Bearish Reversals under 15000 with a gap thereafter down to the 13650 area, and the long-term support starting at 12,221. Yearly does not come in until the 10000 level, so we are not talking about a reversal of fortune long-term. We could really break and that sends cash pouring into government bonds beyond anything we would contemplate. Any paper rated BBB is becoming unsalable. We are starting to see capital even pick up high-rated corporate debt while shunning away from emerging market and local debt. So be on guard for we may be in a real Phase Transition in bonds and to accomplish that we may see really extreme levels in equities on the downside. This may not be 8000 points on the Dow as was the case from 2007 to 2009, but it could be 5000. If this week’s low gives way and we close August BELOW 15555, look out below. We need to wipe out the TV pundits. We will update you on this development, but keep in mind that a break to new lows opens the pattern to the extreme.